Direct Healthcare Group offers a complete collection and decontamination service, not only for our own products, but for large scale decontamination services, required for hospitals and healthcare organisations alike. We strive to maintain high standards in all aspects of customer service and are committed to providing a full and effective decontamination process. Our strong Infection Control policies are ongoing, working documents aimed at minimising the risk of infection to our patients, customers and employees. Direct Healthcare Group is committed to safe working practices, which protect the patient, healthcare provider and personnel in all its manufacturing and services provided. Carrying standards of IS0 9001 (2008), you can take assurance that our impeccable attention to detail address even the basic of procedures. 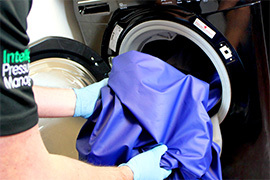 Reduce the risk of cross infection by the reduction of micro-organisms between client use. Maintain the safety and integrity of pressure relieving products. Maintain a safe working environment and promote safer working practices for all DHG personnel handling potentially contaminated equipment. Direct Healthcare Group understands that the increasing standards of Infection control in healthcare environments need to be thoroughly understood by everyone within the organisation. With growing concerns over MRSA, Clostridium Difficile and Hepatitis to name but a few, it is imperative that you work with an organisation that understands the impact of these modern challenges. Micro-organisms are living cells (bacteria, fungi, virus, and protozoa) which cannot be seen by the human eye. They are everywhere, living on our skin, in our nose/mouth and surround us in our normal every day environment. Micro-organisms living on our skin are called normal flora or commensals and under normal circumstances do not cause us any harm. Micro-organisms travel through the environment via body fluids, through the air, in water or droplets e.g. coughing. They can be passed from person to person by direct contact e.g. touching or indirect contact e.g. sneezing. Generally people are more susceptible to infection if their resistance is lowered due to illness or disease and every care should be taken to ensure that the risk of infection to these people is minimised. As vulnerable patients in various health care settings use DHG or other equipment, it is imperative that it is cleaned thoroughly to reduce the number of micro-organisms and minimise the risk of cross infection. Should you require further information on our detailed Infection control and decontamination policies, then please contact us.